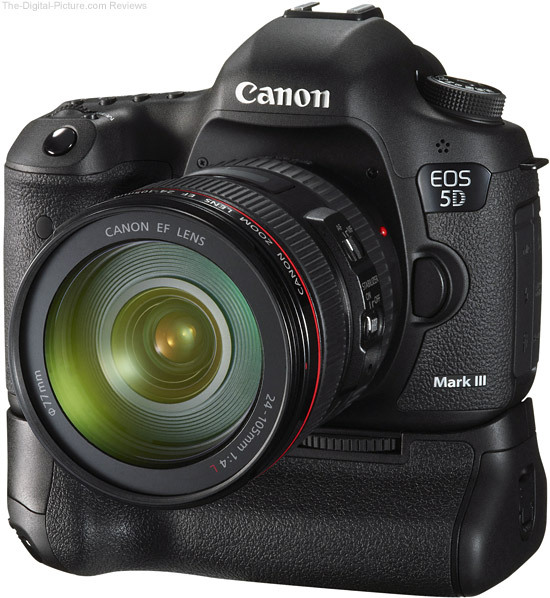 The Canon BG-E11 is the battery grip designed specifically for the Canon EOS 5D Mark III, EOS 5Ds and EOS 5Ds R DSLR cameras. 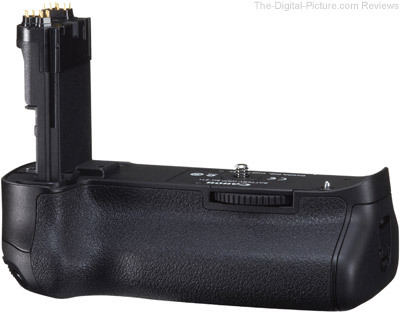 All of Canon's Battery Grips are fundamentally similar to each other in design and functionality, and once again, the BG-E11 includes the basics. 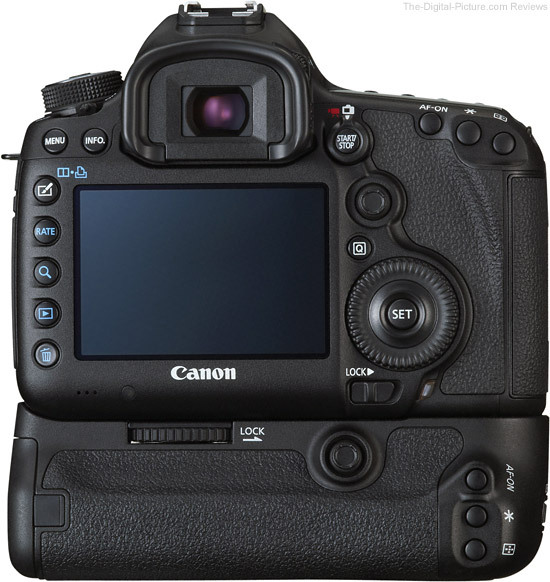 DSLRs without a built-in vertical grip (all non-1-Series bodies at this time) have the advantage of being compact and light, but these bodies are not comfortable to shoot with in portrait/vertical orientation - especially for long periods of time. An accessory battery grip solves this problem by adding a vertical grip complete with shutter release and other relevant buttons. And, the grips allow a second battery to be used for double the battery life. Being easily removable, battery grips allow the DSLR's other advantages to remain available. To install the BG-E11, the LP-E6 Battery is removed from the camera and the battery door is detached. The camera provides a small spring-loaded latch release switch on the battery door to make its removal especially easy. The battery door then attaches to (installs into) the grip for storage (snapping into place over a small instruction diagram). The BG-E11 slides up into the empty battery compartment and locks into place via the tripod socket screw on the BG-E11. The BG-E11 provides its own tripod adapter threads - this functionality is not lost. The BG-E11 holds two Canon LP-E6 Batteries that deliver double the number of shots or video time from the DSLR. Alternatively, use 6 readily available AA batteries in the included Canon BGM-E11A Battery Magazine (a small nylon bag is now provided to store the unused battery magazine in). The BG-E11 works fine with only one LP-E6 battery - a second LP-E6 battery is not required. Don't forget to turn the grip's power switch on. The Canon BG-E11 Battery Grip is very nicely built - it integrates especially well to the 5D III/5Ds/5Ds R body with little flex. As you might expect, the amount of BG-E11 flex is more than with the integrated 1-series grips (with minor tripod use implications), but Canon has done a nice job of meshing the grip to the camera. Like the BG-E9, the batteries load from the end of the BG-E11 grip and orient in line with the grip allow a less-squared and notably-better ergonomic design than the previous battery grips with their rear-loading batteries. Still, the BG-E11 grip is moderately bulky - bulkier than the built-in camera's grip. The normal grip becomes even nicer with the BG-E11 attached - providing more landscape for you hand to grip the camera with. In use, the BG-E11 makes portrait/vertical shooting much easier and more comfortable. I can feel the fatigue difference in my arms and shoulder after using a battery grip for even a moderately long shoot. And, I can hold a gripped camera steadier in vertical orientation - my right arm can be stabilized against my body instead of being held overhead. New for a Canon battery grip is the BG-E11's inclusion of an additional Multicontroller/joystick positioned for vertical use. The new Multicontroller is positioned just slightly less conveniently than the 5D III/5Ds/5Ds R's built-in Multicontroller, but it is far easier to use in vertical orientation than the camera's primary Multicontroller. This position is likely as-good-as-possible without changing the overall size of the grip - which would not be a good idea. The BG-E11's large thumb and shutter release overhangs provide an especially sure handgrip. If you are active while shooting, the more-sure grip is going to be especially welcomed. Overall, I think the Canon BG-E11 Battery Grip is very useful - it is definitely a nice-to-have accessory. The price of this grip will limit its adoption to serious photographers only.